In April, prepays remained below 7% for the second consecutive month, having decreased by 1% from March. Defaults fell to the 4th lowest reading since 1999 and stayed below 2% for the eighth month in a row. This continues the longest such stretch in our database, which goes back to 1999. As for the detail, overall prepayments fell 1% to 6.65% from 6.70% in March. In comparing prepayment speeds for the first four months of 2014 to the same period in 2013, we see that this year is running 11.21% ahead of last year, 7.42% versus 6.67%. As for the largest sector of the market, 20+ years to maturity, prepayment speeds rose by 1% to 6.42% from 6.37% in March. 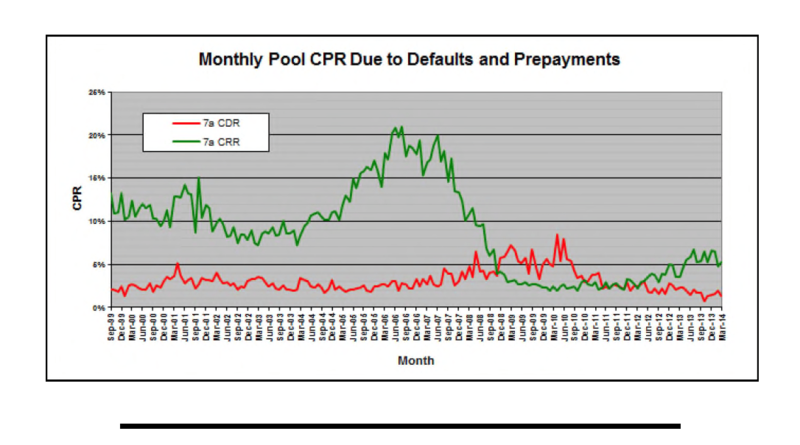 Turning to the CPR breakdown, the default CPR fell by 29% to 1.41% while the voluntary prepayment CPR rose by 11% to 5.25%. After one month below VCPR 5%, we are back into the 5% to 6% range. Preliminary data for next month suggests that prepayments will surge back above 8%, after two months of sub-7% readings. Turning to the default/voluntary prepayment breakdown, the Voluntary Prepay CPR (green line) rose to 5.25% from 4.73%, an 11% increase. While the VCPR rose back above 5%, the Default CPR (red line) decreased by 29% to 1.41% from 1.98% the previous month. Prepayment speeds fell in three out of six maturity categories. Decreases were seen, by order of magnitude, in the 16-20 year sector (-20% to CPR 3.63%), 8-10 (-11% to CPR 7.26%) and 10-13 (-10% to CPR 7.26%). Increases were seen, also by order of magnitude, in the <8 sector (+76% to CPR 11.09%), 13-16 (+71% to CPR 9.44%) and 20+ (+1% to CPR 6.42%). After two consecutive months of sub-7% readings, we expect prepays to bounce back into the 7% to 8% range, where we have spent most of the past 12 months. In light of the past 2 months of relatively low prepayments, our expectation for 2014 remains unchanged. We continue to see prepays for 2014 about 5% to 10% higher than last year.